Late March really kicked off the year for fashion lovers in Ghana. 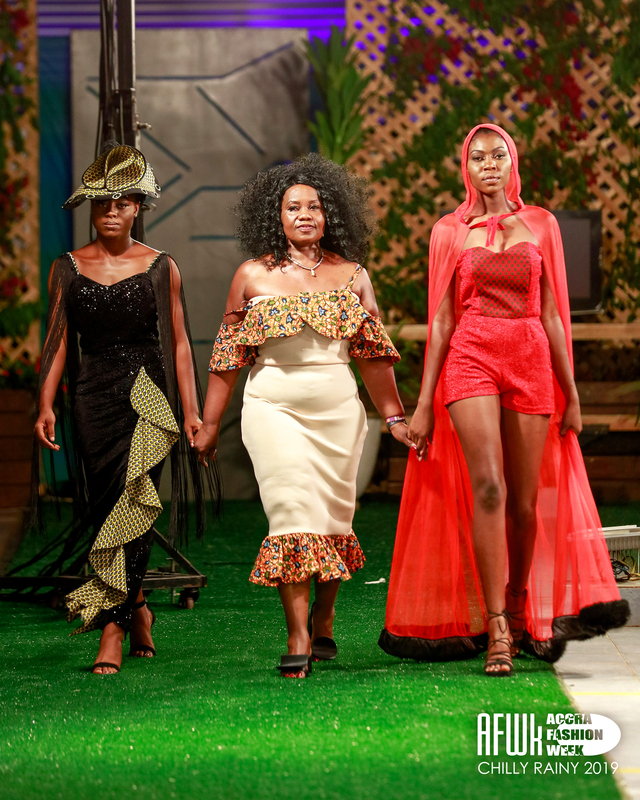 Once again, the “Chilly Rainy” edition of Accra Fashion Week opened its gates at the Silver Star Towers, near Accra’s Airport. The much-anticipated event did so in fabulous style, with an eclectic mix of designers rocking the runway from March 28 – March 31st. And of course, this edition had its own theme: “Industry Revolution”. This year’s State of African Fashion Conference kicked off the festivities on Day 1. The seminar set the tone for a range of events specifically directed towards celebrating and empowering Ghana’s growing fashion industry. The panel included industry experts such as Mont Oz from South Africa, Andrea King from Barbados, Nigerian fashion expert Ovo Ogufere and Ghana’s very own Ajepomaa. The audience joined in on a very educational and informative day of discussions on ways to improve Accra’s local fashion industry. 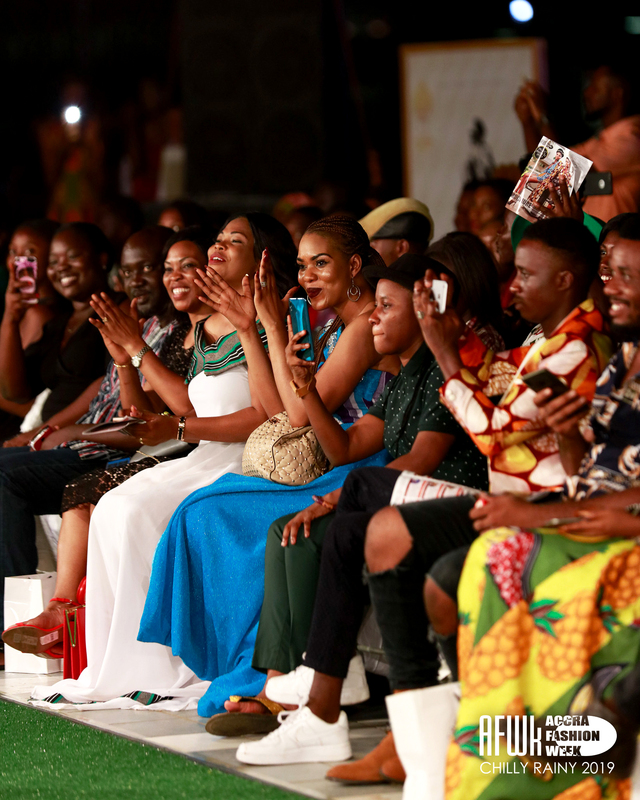 On day 2, the 4-day event continued with the Fashion Ghana Honors and Awards 2019. It’s aim was to acknowledge the great talents in the Ghanaian fashion industry. 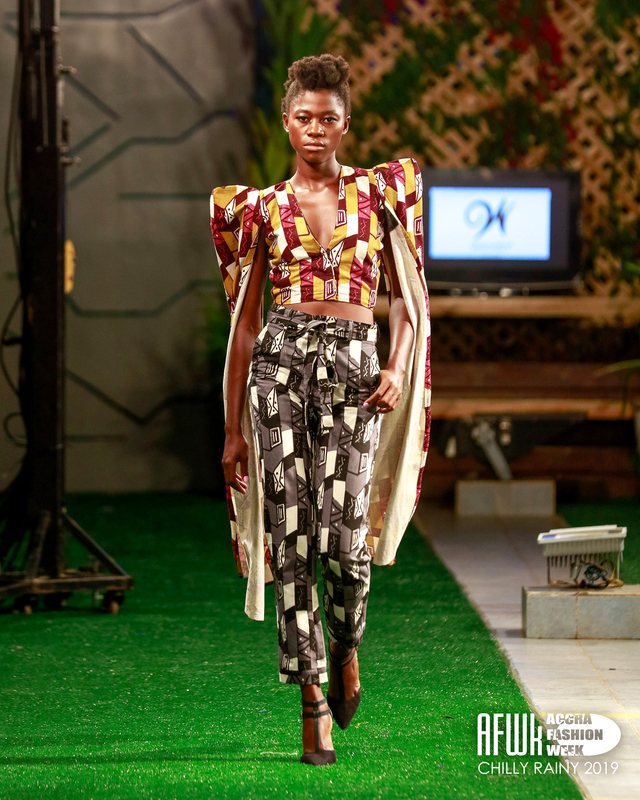 The competition known as “Woodin Student and Graduate Show” followed through on March 30th. Limited to student designers currently studying fashion or working in fashion, this contest gave tomorrows designers their time to shine and impress the audience. It was more than a worthy warm-up for the main fashion shows, as the students really showed class and proved their worth. 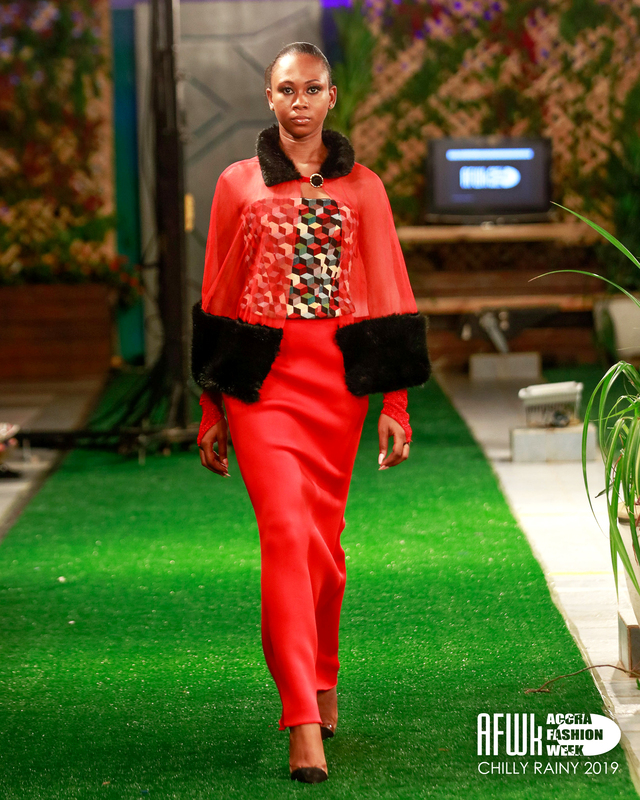 The main runway show eventually showcased Tolumi from Nigeria, then continued to host and display some of the best brands within Ghana and beyond. Young designers exhibited their talent and class in the shape of inspirational outfits. The overall style was cool and urban, yet chic at the same time. Some of them dared to set new trends for Accra’s streets. Amongst the designers were Afre Anko, Akinko, Coco Eleganza, Miraaba Couture, Mikoko Deluxe, and Dapper Afrique from Ghana. The event wasn’t only for the local heroes. Many fashion stronghold nations were represented as well, in the shape of Lomzy and Nucciano from Nigeria, Mercy Kay and Tobbam Colors from the UK, Nina Sharae from the USA, Ebony by Bernice from Italy and 5th Element from Barbados, to mention but a few. The successful show was eventually closed by an exciting local designer, Ghana’s Jay Ray Ghartey. Accra Fashion Week Chilly/Rainy 2019 was proudly organized by FashionGHANA.com and sponsored by Orca Deco, Woodin Fashion, Shea Butter, and CIROC. See some of our favorite images below and stay tuned! 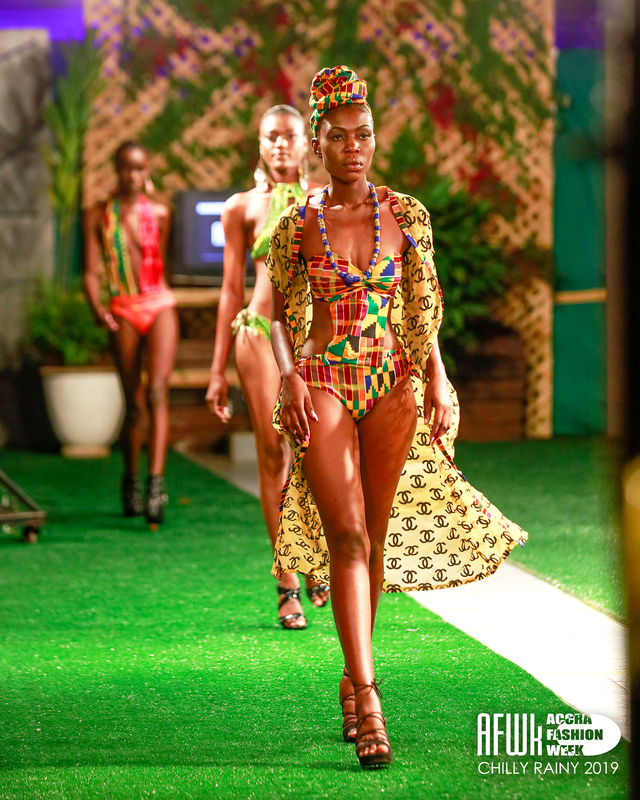 Accra Fashion Week happens twice a year and the “Summer/Harmattan” edition happens in October.